From whole duck foie gras with Armagnac to all natural, pork-free truffle mousse, Fabrique Délices, a traditional French charcuterie company in San Mateo, has been preparing time-honored classics alongside innovative new products for the past 15 years. With an extensive product line that includes blood sausage, duck confit and country pâté, Fabrique Délices produces 2,000 pounds of product a day. 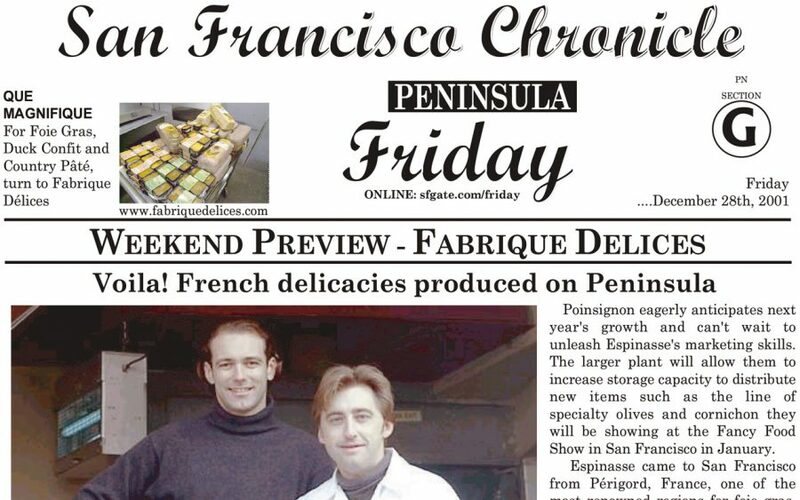 Marc Poinsignon, président and Antonio Pinheiro, co-owner, vice président and chef, came to California 15 years ago when Sapar, the French company they worked for, bought the San Mateo charcuterie plant. Poinsignon bought out the company in 1996 and retained the name for brand recognition. Because business has expanded over the years, Fabrique Délices has outgrown its 6,000-square-foot plant in San Mateo. Between Christmas and the new year, they will be moving across the bay to Hayward, where they will be able to triple their volume in a new 20,000-square-footfacility. “It’s a big expansion. Everything is brand new. We got a Rolls-Royce,” Pinheiro said. Poinsignon eagerly anticipates next year’s growth and can’t wait to unleash Espinasse’s marketing skills. The larger plant will allow them to increase storage capacity to distribute new items such as the line of specialty olives and cornichon they will be showing at the Fancy Food Show in San Francisco in January. Espinasse came to San Francisco from Périgord, France, one of the most renowned regions for foie gras, which is enlarged duck or goose liver. In Périgord, “Bed and breakfast is basically bed and foie gras,” Espinasse said. Though foie gras is not as abundant in the United States as it is in France, nor as cheap, ” The customer knows foie gras. He has been in Europe traveling,” Espinasse said. And products such as duck rillettes, which are from the southwest of France, are “Hard to sell but fun to demo and try to sell. Usually, when you introduce a specialty product to a new market, it will be recognized by people who have money to travel and to eat in upscale places where specialty food is coming to the table, “Espinasse said. There are three main segments of Fabrique Délices’ business. First, high-end retail stores, such as Draeger’s, Andronico’s, Oakville Grocery, Whole Foods and Schaub’s Meat and Poultry in Palo Alto offer a wide variety of Fabrique Délices’ products.